A couple years ago, I was visiting a northeastern ski area in the midst of implementing some major “guest-experience improvements” that would not only enhance its bottom line but possibly infuriate a decent portion of its longtime passholders, who didn't feel that these changes would enhance their personal experience. When I asked the marketing director if he was concerned about negative press, he quickly replied, “I don’t care what people write, as long as they write something.” I appreciated his candor and commended him for not wanting to have it both ways — you can't simultaneously attract people who'll spend lots of money while keeping it "all about the skiing." The you-can't-have-it-both-ways dilemma came up again last season following a week-long visit to Ischgl in western Austria, which is well-known in Europe for its extensive, high-altitude terrain, excellent snow preservation, top-of-the-line lift system, and reliable five-month ski season. That said; do a quick Google search on Ischgl and you might come to the conclusion that its real claim to fame is as the world’s hardest partying ski town. With 40+ bars, a handful of glitzy strip joints, and a dollop of luxury stores, Ischgl throws down the gauntlet to fun-lovers and challenges them to Relax. If You Can: a hedonist variant of Mad River Glen’s beloved tagline. To provide some visual context, here's an almost NSFW youtube video that effectively portrays what it's like to be young, attractive, and dancing nightly at the Schatzi bar. Given how successful the resort has become over the past decade or so, I was surprised to stumble upon an article a few months ago in which a representative of the Ischgl tourism bureau conveyed her frustration with how the media seems to zero in on the town’s nightly Bacchanalian festivities far more than on its world-class ski offerings. At first, I thought that the complaint rang as a bit disingenuous — a clear case of "don't criticise that which pays your mortgage" — however, after spending a week there last January and getting a taste of its impressive on-mountain offerings, I was a bit more sympathetic to her marketing quandary. So in that spirit, the following article is going to be based on a solo, but family-appropriate vacation I spent there last January without my family. Instead of schnapps-fueled sing-a-longs, euro disco, and buxom waitresses in revealing dirndls, I skied bell to bell, ate great food, met friendly people, floated through lots of untracked powder, and went to bed at a respectable hour for seven straight nights — and did it all on a reasonable budget. Austria's principal market differentiator is that it steers clear of the soulless, purpose-built infrastructure that's more prevalent elsewhere in the Alps in favor of tailoring historic villages to the needs of modern ski tourists. Nestled in the Paznaun Valley, about 90 minutes southwest from Innsbrück, Ischgl is a perfect example of that strategy: traditional Tirolean buildings, narrow streets, a mostly traffic-free town center, and lots of beds for such a compact village. But instead of Lech's understated elegance, a quick stroll through town reveals a high-octane street ambiance that's more similar to the quasi urban feel of Kitzbühel. With most of the accommodations on the pricey side, I opted to establish my headquarters at the quiet and less expensive village of Galtür, 15 minutes away via the free and frequent valley ski bus. With 2,100 vertical feet and six clearly defined terrain sections, Galtür was not only a great place to warm up after a transatlantic flight, it's also well designed for families. Moreover, the village has street cred as the setting for An Alpine Idyll, a morbidly unsettling short story from Ernest Hemingway, who spent the winter of 1925 earning turns and drinking with locals throughout the region. The Paznaun Valley is proud of its connection to the American literary icon and there are all sorts of mentions about his time there. For many European skiers, Austria conjures images of gentle, low-altitude slopes winding through wooded mountains, such as the Kitzbühel Alps. They're scenic, iconic, and romantic, but not necessarily reliable for trips booked months in advance. 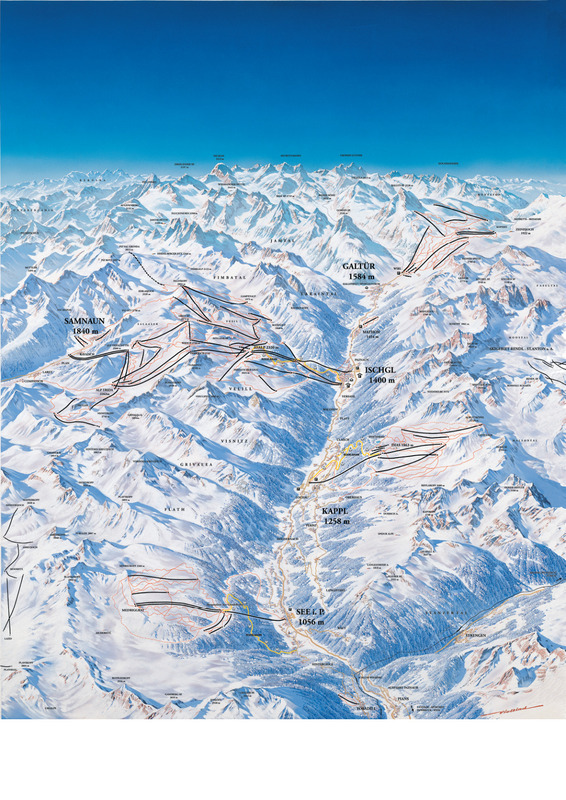 On the other hand, more than 80% of Ischgl's terrain is above 6,500 feet, making it the largest concentration of high-altitude skiing in Austria, and more similar to many French resorts. 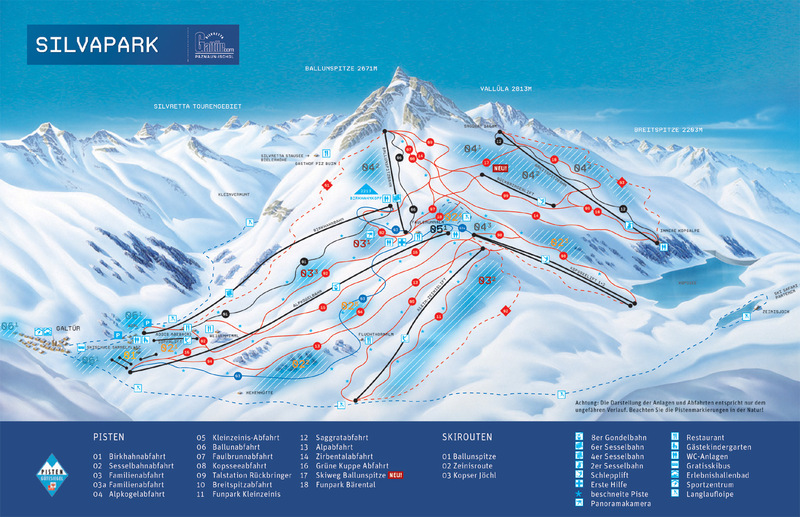 Combining those advantageous characteristics with predominantly north/northwest exposures, a battery of more than 1,000 high-tech snowguns, and the fiscal wherewithal to use them allows Ischgl to routinely open a large number of its runs before December, resulting in reportedly the longest lift-served season among non-glacial resorts in the Alps. It's therefore not a surprise that Ischgl gets a lot of business from people who don't want to take any chances on getting skunked with poor conditions. The late November opening and early May closing are positioned as a key part of the Ischgl brand and to drive that point home, the resort hosts huge "Top of the Mountain" outdoor concerts to kick off and conclude its ski season. Over the past 18 years, such musical superstars as Bob Dylan, Tina Turner, Elton John, Mariah Carey, Bon Jovi, Enrique Iglesias, Pink, Scorpions, Katy Perry, Alicia Keys, and many others have entertained the multitudes in the mid-mountain Idalp area, where your lift ticket is also your concert ticket. If you've ever spoken to a U.S. skier who's spent time in the Alps, one of the first blanket generalizations you’ll hear is how people there seem to be far more enamored of skiing groomed trails than North Americans. Over the past 15 years, the English gerund "carving" has found its way into many languages and seems to exert an almost mystical power over European skiers. For the record, this isn't to say that no one there ventures into the off-piste, but anecdotally, it feels like a far smaller percentage than we stateside skiers are used to. Similar to Lech, even when acres upon acres of untracked powder beckon just a few yards from the main trails, most of the holiday punters at Ischgl stay on the well-manicured expressways as if they were tethered to a dog run. An exclamation point to this observation came when I stumbled upon 14 Pisten Bullies performing a synchronized groom on a principal mid-mountain trail during the early afternoon. According to a "did you know?" 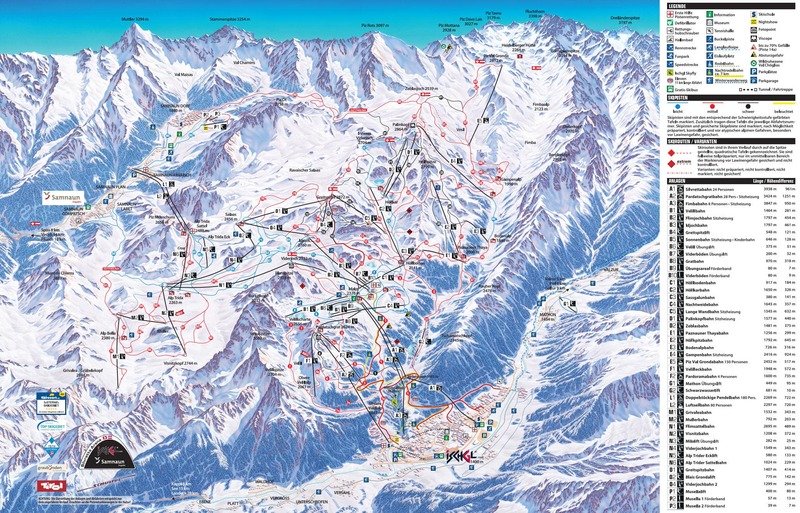 factoid on the ski map, Ischgl has 36 of these bad boys, each with a $650,000 price tag. Clearly, customers place a lot of importance in grooming, and the ski area follows their lead. While few resorts can compete with nearby St. Anton for top-shelf expert terrain, mere mortals will find it tough to get bored at Ischgl. With lots of long, consistent descents serviced by high-speed lifts (80% of them are detachable), racking up big vertical is a foregone conclusion. Piles of low-hanging off-piste delicacies can be easily scoped out from the lifts and are usually right alongside the groomed trails, providing easy bail-out options. And if you can part with some additional discretionary income, hiring a guide will truly give you the keys to the kingdom. Although it's not a personal sweet spot, one of Ischgl's attractions is a "duty-free run" from the very top of the ski area, Palinkopf, down a scenic expressway that drops 3,500 verts across the Swiss border into the village of Samnaun. There, you can check out 64 shops selling all sorts of consumer goods to schlep back to your hotel in Austria. It seems like a lot of work just to save a few shekels, but tourists just can't help themselves; duty-free is a big racket there. After several days of industrial tourism at Ischgl, it felt great to take advantage of the Silvretta ski pass, which also covers three smaller satellite ski areas in the Paznaun Valley. All are worth a day of exploration, both for a pleasantly uncrowded ski experience and the chance to rub shoulders with people from the region. Kappl, ten minutes down the road from Ischgl, was my favorite of the smaller mountains. It has a reputation for being modest in size, but the upper terrain felt quite roomy, including 27 miles of cut trails covering more than 3,000 vertical feet with piles of nicely-pitched off-piste, and sparse trees toward the bottom. Following an overnight storm that dropped six inches of snow, I was one of barely 100 people on the entire mountain, almost all of whom refused to leave the groomed trails. For the next three hours, I tracked up lap after lap of calf-deep pixie dust — so easy, it almost felt unfair. Although Kappl's elevation is even higher than Ischgl, most of it faces due south, so the powder started thickening up by early afternoon. Still, getting the "private mountain" experience, if only for a morning, was unforgettable. As I was boarding the bus back to the hotel, I ran into an American and together we shook our heads in disbelief over the fact that this mountain is the Alps equivalent of a local's hill. I finished out my stay at See (pronounced "zay" — German for "lake"). Just like Kappl, you take a gondola a couple thousand feet about the village, followed by a high-speed chair for the final 1,800 vertical feet. The upper mountain has a definite Grand Targhee feel about it, a consistent double-blue pitch, along with all sorts of steep trees on the skier's right. Similar to Kappl, it was great to nail first tracks with several dozen friendly locals. A fact of life at places where you can ski pretty much whatever you see is that unless you happen to have had the foresight to pack some night-vision goggles, visibility on storm days is going to be challenging. After greedily wallowing in knee-deep powder during a near whiteout, I had to sit down for about 40 minutes to get my head to stop spinning from the vertigo. Luckily, I eventually found my way to some nice treed terrain on the lower mountain (including the gorgeous Fimba Valley, pictured in the top photo), which was, like the rest of the off-piste, completely ignored by other skiers. It's small potatoes, of course, but compared to the lower-altitude Austrian ski areas, Ischgl doesn't have much in the way of cow barns and huts that have been converted into atmospheric cafes, ice bars, and restaurants — places where you can dawdle over a cappuccino, wheat beer, or mixed drink and feel at peace with the world. Instead, many of the on-mountain eateries, especially the huge gleaming lodges at the mid-mountain Idalp hub, felt more like a modern convention center or train station. 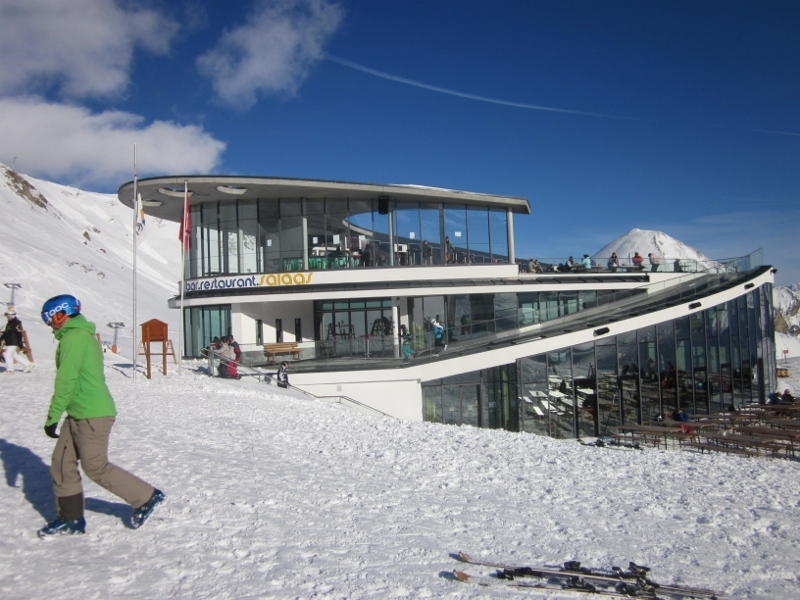 For example, Restaurant Salaas on the Switzerland side (which allegedly serves a great fondue) brought back memories of the old TWA terminal at JFK Airport: architecturally interesting, but not what most people want to see at 8,200 feet. 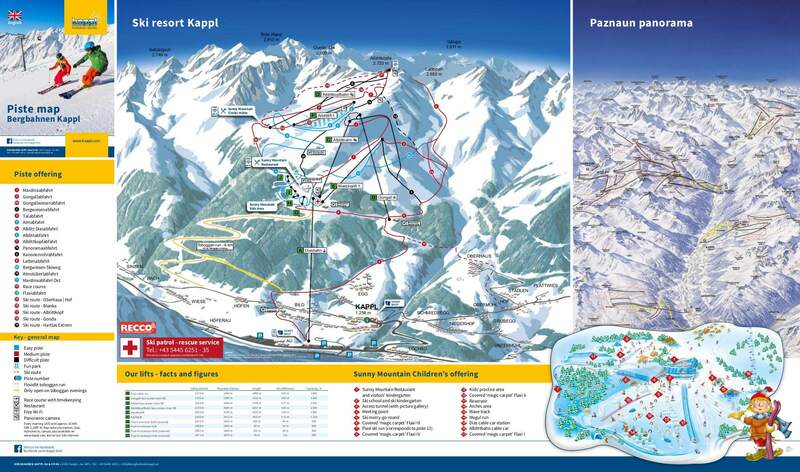 Finally, as mentioned earlier, aggressive skiers may find Ischgl's on-map offerings to be a bit tamer than they'd like. For those who want to scratch that itch, world-famous St. Anton is up the road 40 minutes. That said, with a bit of poking around, it's easy to find plenty of entertaining lines and I can only guess at the great terrain you'll discover with a guide. While those who prefer a more traditional winter destination that minimizes the non-skiing distractions may not be inclined to give Ischgl a try, my visit proved that you can have a successful ski-centric visit there. The trick to accomplishing that objective is to use one of the smaller villages as your base of operations. Between the big show at Ischgl and the handful of fun locals' mountains, the Paznaun Valley offers a pretty compelling ski experience: reliable conditions, extensive and varied terrain, easily accessible and unpopulated off-piste, fast lifts, and a long season. Although the tourism office may never completely succeed in taking the spotlight away from the nightly action in the village, most observers agree that Ischgl is easily one of Austria's Top 5 resorts purely from a skiing perspective. And in case you've forgotten; if you're in the mood to party like its 1999, you have that option as well. The American Dream? Alta elevation and snow with no competition (or traverses). Your favorite place to ski in Europe or the world? Sounds like it. Great feature James. Thanks!